Acrodyne > News > Acrodyne’s Family of Fail Safe Electric Actuators. Acrodyne’s Family of Fail Safe Electric Actuators. ACRODYNE adds the Noah SR-30 to it’s family of Fail Safe Electric Actuators for Power failure & Emergency shut-down application. The Noah range now consists of 3 models- SR-05, SR-10 & SR-30 with torques ranging from 50Nm to 300 Nm. Operating Principle: The design consists of a spiral wound spring mechanically coupled to the actuator out-put drive shaft on the same axis and enclosed in a housing integral with the main housing. In the “power on” mode, the motor drives the actuator out-put shaft simultaneously loading the spring in the same direction till end of travel. An electro-magnetic brake locks the output shaft & prevents the spring from releasing it’s energy. On loss of power the brake is released and the spring drives the actuator in the opposite direction. The spring is preset for “normally open” or “normally closed” position of valve. 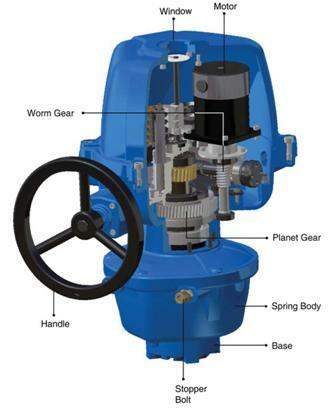 The Noah spring return electric actuators find wide application in emergency situations such as: dangerous leaks, burst pipeline and untimely power outages. It is today’s Industries’ choice where safety and reliability are so critical to process automation.